Hi everyone! I hope your weekend is going well so far. 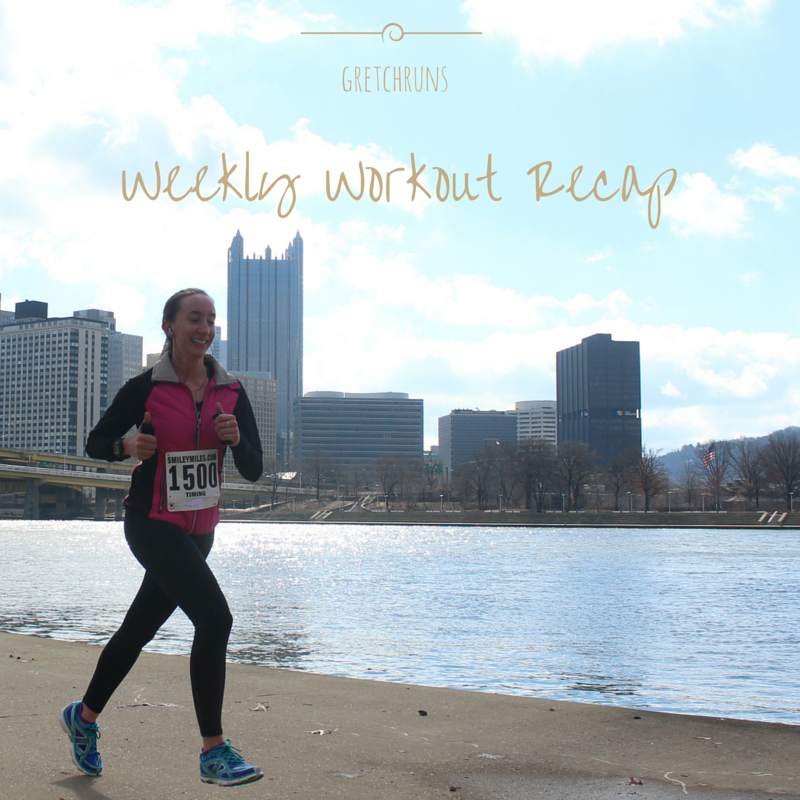 I'm here to recap my week of workouts, which I'm very proud of! I got over 20 miles in, and incorporated two days of yoga. Let's get into it! I felt great this morning and it was gorgeous out. I always start out really slow during my morning runs (I guess I'm not fully awake until I'm a mile in) and my splits were 10:03, 9:23, 9:03. Entire run felt good and easy: exactly what I needed! I didn't go on a full run today, but I did walk lots of dogs at the Humane Society. We recently got a 10-month white Siberian Husky who was full of so much energy, so I took her for about a 2 mile run. She wasn't tired out at all from the run but I was! True Runner had their Hump Day Hills run, and Dan and I conquered Shady Ave together. It was really hot and sunny out, so the hill seemed even longer! We did four repeats up and down the hill, with a mile warmup and cooldown. Tough run but lots of fun with a huge turnout! Slept in a bit, so I was only able to get two miles in. The weather was perfect: 55 degrees and no humidity. Everyone's always told me that 55 degrees is the ideal running temperature and now I understand why! This makes me excited for fall running and racing! This was a great (short) video with lots of leg stretches. I really like the instructor because she's more relatable than most YouTube instructors that I've found. Definitely going to try more from this channel! On Fridays I work from home, so I decided to take a walk through the trails in Frick. It was a gorgeous day out, and I found some great hills. It was a tough walk but a great way to stretch out my legs and take a break from staring at a computer screen! Since I skipped Centergy earlier in the week, I decided to go on the weekend. The class was great and I worked on making the poses more intense (like holding a few inches from the ground before doing updog instead of dropping to the ground). Great workout! I was supposed to run, but Dan and I stopped by the Vintage Grand Prix car show and walked a ton in the heat, so I was completely worn out and had no desire to run at all! A nap was a much better choice when we got home. I'll share some pictures from the car show tomorrow. It was a ton of fun! I got to meet Jennifer and run with her for the first time! We met on CMU's campus, so I ran down there to meet her. We did about 4 miles together, then walked around Pitt's campus to Schenley Plaza for a tai chi class (that was cancelled we're guessing because no one showed up! ), then I ran home. Around 8 miles in total with a few breaks. It was super hot so I'm so glad I wasn't alone for this run! Great week of training! I improved from last week which is great, and I can feel myself getting faster and being able to run further. I also got a bike this week, so I can add that to my workouts going forward as well! Nice workouts this week! What a change in the weather though, huh? From perfect one day to wicked hot a couple of days later. All good though - this is what makes us stronger in the long run (pun very much intended)! Nice week! Kudos for doing the hill repeats up Shady Ave in this heat! Sounds like a killer workout. Thanks for running with me! It was so great to finally meet you! Yes there are..so gorgeous. The car show was great and there were so many different kinds I've never seen! It was really hot and crowded though so it was probably a good thing you missed it! Excellent week! I love those weeks where every run feels great and you can tell that you are improving. I sort of had the opposite week where every run is a bit of a struggle and I wonder what sort of crazy inspired me to sign up for a marathon. I think it all has to do with the weather. This week was brutal (luckily I went in the mornings when it wasn't bad) but that always affects how I do. Hope that you bounce back this week!